Was this the worst loss ever? It might have been. The Jets were so bad in the first half of their 24-19 loss to the Steelers on Sunday night that it is hard to imagine that there is anything worse in their long history of pain and suffering. Down 24-3 at the half and seemingly out of hope, the Jets rallied their way back to 24-19 before giving the ball to the Steelers just before the two minute warning. Three stops, three timeouts and the Jets would have the ball back with enough time to author a classic comeback, but they couldn't do it. Ben Roethlisberger, who escaped disaster so many times that his face should be on the NFL Mount Rushmore, found Antonio Brown on third down with the entire faith of a franchise on the line to extend a Steelers drive and win a game that might have caused more pain than any other in the long, painful history of the New York Jets. The pain is so deep because there couldn't be any doubt that Mark Sanchez would have gotten the job done if the defense could have gotten him the ball back one more time. After a first half directly from the worst fears of every Jets fan on the planet, the team rallied and found their footing. A long touchdown pass to Santonio Holmes, a safety after a brutal failure by the offense on the goal line and a touchdown pass to Jerricho Cotchery put the game in the hands of Rex Ryan's defense. And they didn't get the job done. Brown made the catch, the Steelers ran the clock out and one more year was added to the misery that is the existence of every Jets fan that was born after 1960. 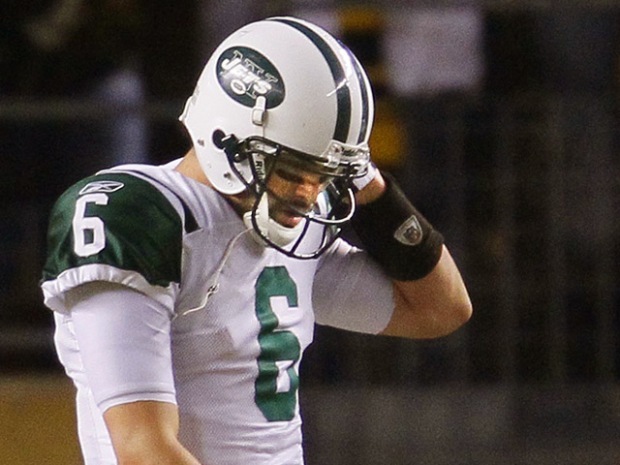 There is plenty of blame to throw around, from Brian Schottenheimer's play calls to the brutal roughing the kicker call in the third quarter to Sanchez's fumble that made the game 24-0 just before the half, but the fact is that the Jets were sitting with a chance to win the game on third and six with their defense on the field. They failed, the Steelers advanced to yet another Super Bowl and we are left to try to pick up the pieces of the loss one more time. They came so close, closer than any Jets team has ever come since Joe Namath's guarantee, but it wasn't enough. Not nearly enough to make up for the chances squandered in a game they absolutely should have won. They came out flat, spotted the Steelers a huge lead and could never catch up. That will be the thing we remember through every minute of the offseason. It won't be fun, not by a longshot, but it will feel all too familar to those of us who have suffered with the Jets through every minute of their existence.